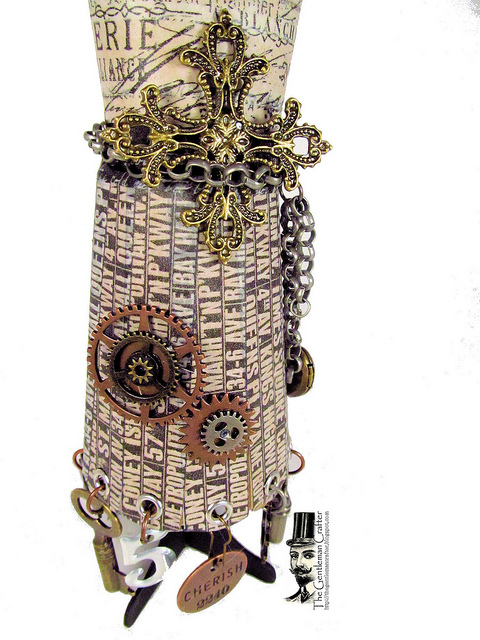 The Gentleman Crafter: Steampunk Dress Form! Hope your day has been awesome. It sure has been good getting back into the routine of things!! It seems like I haven't seen my studio in a month. Well, almost a month. It was so good to get in there and start creating, It was also good to get back to my job. I've been there collectively 6 days in the past 3 weeks! I also missed my drive to work. Why? With my hour commute to and from work, I call this, "ME TIME"... It's my time to be alone and think about what my next move will be, what I want to work on, what I need to do and so on.... so today I thought of a few cool projects... some that I can't wait to start and some that I already have in the works. Tonight, I had my usual 3 projects going on and I was happier than a pea picker in a field full of Lima Beans! LOL! I had so much fun! I finished a couple tonight, but will show you one tonight and the other tomorrow. This evening, I also did several short YouTube videos on the techniques I covered on Ustream last night. So go catch them if you would like. I cut the bottom of the dress form from my pal, Eileen Hull's Vase 3-D from Sizzix out of chipboard. You can find the die HERE. 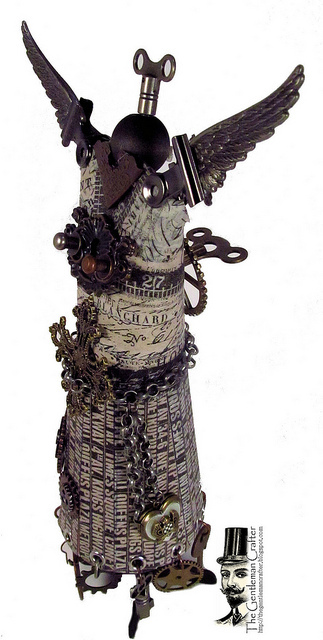 I turned the vase upside down and covered it with Tim Holtz Idea-ology tissue tape. I then punched holes in the scallops of the vase and added eyelets at every scallop. I placed jump rings into the eyelets and added charms to each. Next, I took a toilet paper roll and cut it in half and rounded off the top corners. I notched out the center into a "V" and then glued the center to form an upper torso. Once again, I covered the tissue roll with tissue tape and adhered the upper torso to the vase forming a dress form. Then my favorite part...adding the metal! Love that part! 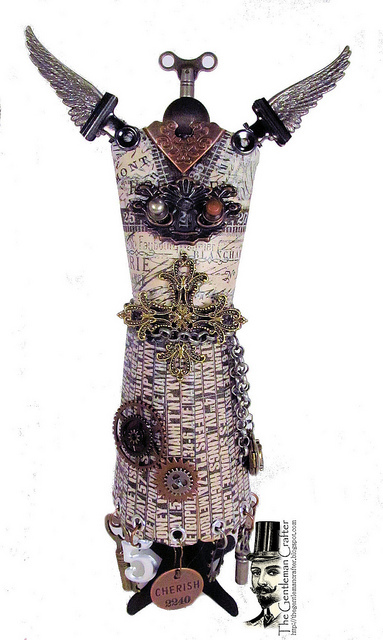 Chain and a locket around the waist, wings held by hinge clips, gears, and a few clock keys. Yep! I love that part! Last, she...or shall I say, the dress form needed to stand on something! GUESS WHAT...Eileen Hull's Cupcake Stand fits the bill perfectly! You can find the cupcake stand die HERE. I cut the base part of the die from chipboard and painted it black and glued it to the inside of the vase. Done! That was so much fun! I think she came out pretty cool! If you need a fast and easy dress form, try this out and think of the possibilities. Hope you found some inspiration from this project! So neat to think of things you can do besides what something is meant for. Finding more than one use for a tool makes it a great investment. Have an awesome day everybody! Thanks for coming by! Jim, I LOVE how you used those dies in totally unexpected and unique ways. The dress form is unbelievable. So sorry I missed the UStream- I have a friend in town and we were carving stamps tonight. Will go and check it out now. Thanks so much for using the dies! It's so nice to have you back Jim! You sre so clever to use those dies to make a dress form! Your "me" time driving is obviously paying off! I don't know how you keep coming up with such amazing creations, but I'm glad you do, that is stunning. I finally remembered to sign up to your email subscription, so I won't miss any more posts. I see a empty toilet roll as, well, an empty toilet roll. So glad your imagination can see past that and come up with really unique ideas - keep 'em coming, I say! Love how many elements are on the dress form. Jim is back in the house! Why does she remind me of a Valkyrie? Love it! The Cardboard Cowboy is back in the saddle again!!! Welcome home, my friend!!! I'm so glad you're back in the studio creating what you love!!! That is amazing! Looks like a very cool angel to me. I am still chuckling over your lima bean expression. As a New Yorker, I have never heard that one! Glad you are home safe and sound and back to your routine. Me, I am looking forward to going on vacation next week down south (VA) and running around Colonial Williamsburg with my camera! I love how you made this dress form and especially the unique manner in using an empty toilet paper roll. Great project! Fabulousity! She is too cool. Very clever Jim! Wow... I love it! It turned out wonderful! I bet it is feeling good to get back into your normal routine! I find myself out of sorts if I'm not doing my routine! Glad that you got to play in your studio!!! Can't wait to see all of your upcoming creations! Have a fabulous day!!! Enjoy Yourself!!! With my die addiction, I love seeing ideas on how to use them in unexpected ways. Yours is a great one. 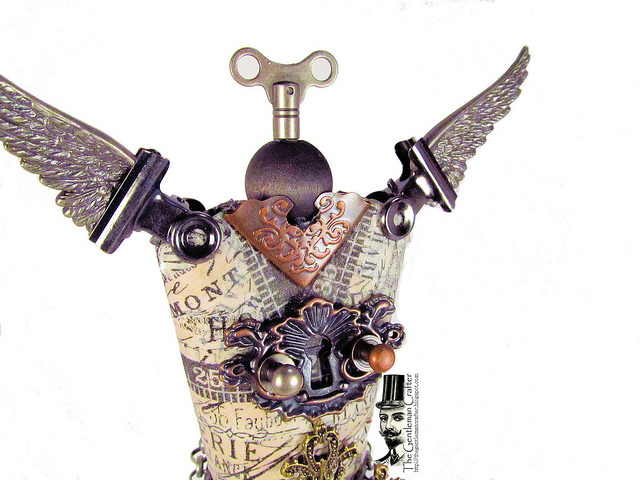 This is truly steampunk haute couture. It was so refreshing to hear your positive approach to a long commute. This is brilliant. Instead of losing 2 hours to anger, you come up with wonderful, unique ideas. Lucky us. I benefited from your travels so I'm glad you ventured out of Texas. Thank you so much for trying the tie on during Ustream; made my day. I bet you're awesome on Christmas morning. Welcome home! Oh my gosh! Just saw the tornados on the news. Hope you're all safe n Texas. Ahhh, back in the studio and jumping in with both feet. Love this. Your use of dies in unexpected ways is inspiring. Steampunk warrior! The charms at the bottom are cool. You rock! I agree ..............you ROCK !!! Looks like one of the Knights of the Roundtable!! Truly cool!! Oh this is way cool... who'da thought a vase could be a dress form !! Man o man the DETAILS... my goodness Jim ... just amazing !!! 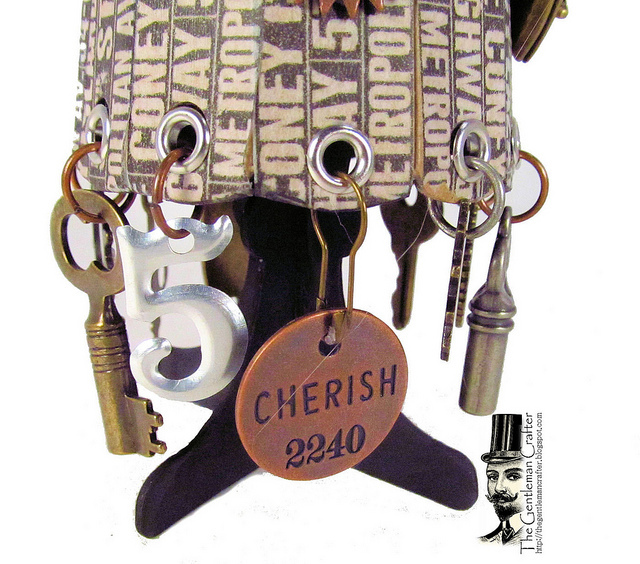 Love that Steampunk style! Also love the way you use things in a new and wonderfully interesting way--like the corner thingies on the shoulder. Today at Michaels I found (in the dollar/two dollar aisle) papier mache dress forms both male and female. Guess I need to Steampunk them up, huh? Wow!! I love it!! 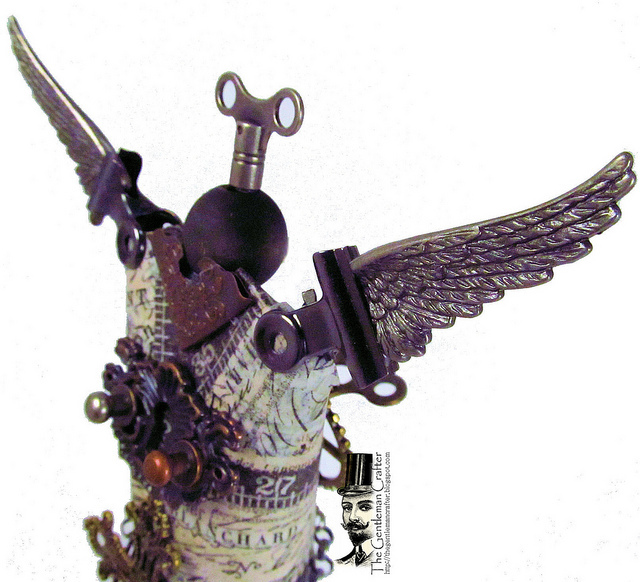 I love the steampunk style!! Your designs are fabulous and so unique, Love them!! Seriously it's really unique or different..I never seems these type of dress ever..This is so heavy to wear..